Some other highways, including the one connecting the country to neighboring Georgia, were also reportedly blocked by the opposition. 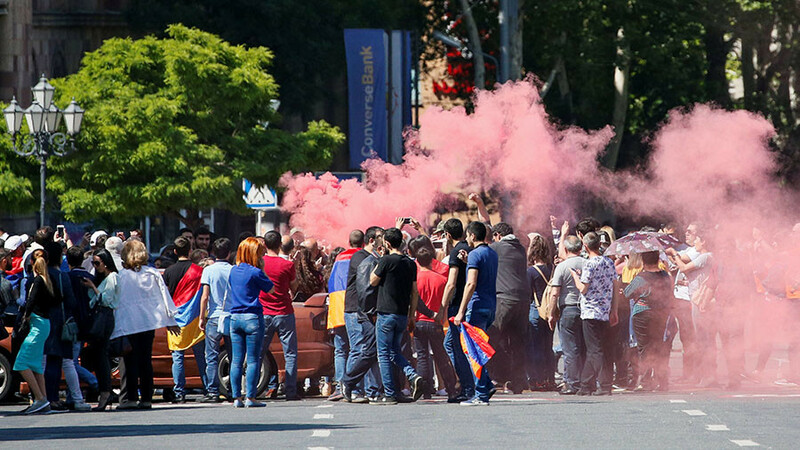 In Gyumri, Armenia’s second-largest city, the protests escalated into a takeover of government buildings. Demonstrators broke into the mayor’s office, demanding that he join the opposition movement. Levon Barsegyan, one of the protest leaders, said the opposition was in control of most government premises in the city, TASS reports. The protests renewed after Armenian protest leader Nikol Pashinyan failed to obtain the position of prime minister on Tuesday, and called for a nationwide strike for Wednesday morning – urging supporters to blockade roads, railways and the airport. Following heated debate in parliament, the 42-year-old opposition candidate received only 45 of the 53 votes needed to secure a majority in the 105-seat chamber. Nevertheless, Pashinyan has insisted on electing what he called “the candidate of the people” to oversee the snap elections due to his distrust of the ruling Armenian Republican Party and the acting Prime Minister Karen Karapetyan. Notably, while Pashinyan has secured the support of several opposition factions, his own Yelk faction has only nine seats in parliament.